What the f*ck did I do to deserve this complete and utter karmic kick to the crotch that I’ve been getting lately? Remember last week I mentioned that I was going to get my starter installed at Crappy Buy? Yeah. Ummm. No. Wait. I already told you that part. Jump ahead to this morning when I showed up (EARLY thankyouverymuch) and was told (by the same scrawny kid) that ‘he would NEVER have told me to come in on a Friday for a starter install’. HUH. Then WHY is my name right there on the schedule, numbnuts? (do I get karmic credit for NOT smacking him in the head with the appointment book?) This time I had a total meltdown and requested the manager. Loudly. I then proceeded to completely and utterly confuse him by using words with more than two syllables. The result of my ‘putting my paralegal on’ (as RR likes to put it) is that I am on the schedule for tomorrow morning and will be credited for the install (and my gas cost – but the manager doesn’t know that. yet.) And I swear to God if it doesn’t happen this time I’m going to LOSE. IT. AND return the starter (by shoving it up the manager’s…yeah, you get it). So, after a cooling-off period at Sam’s Club I spent a nice quiet couple of hours at my not-so L YS (Thanks, Karin!) which helped me recharge my batteries for dealing with Dobby this afternoon. See, her grades dropped after getting her cell phone so she’s lost it and doesn’t understand the concept of ‘no grades=no phone’ which means I get verbal abuse when I explain the rules to her for the gazillionth time. Trust me, it’s fun for the whole family. Try it with your teen. *sigh* Okay fine. If you insist ;o) Yesterday I started working on the Oak Rib socks from Vintage Socks using the Mountain Colors in Obsidian (which is GORGEOUS in person). I finished about four inches on them at the store today. 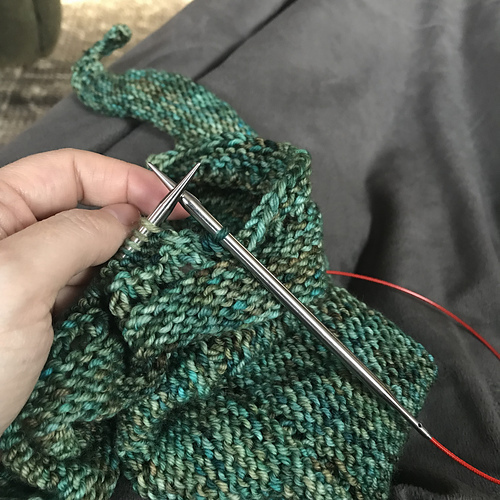 Two more inches and I can start the heel – yay! On the retail therapy front, I got sucked into the STR club by a certain person (you know who you are) ;o) *sigh* I’m such a joiner. I’m actually pretty excited about it and can’t wait to get my first package! 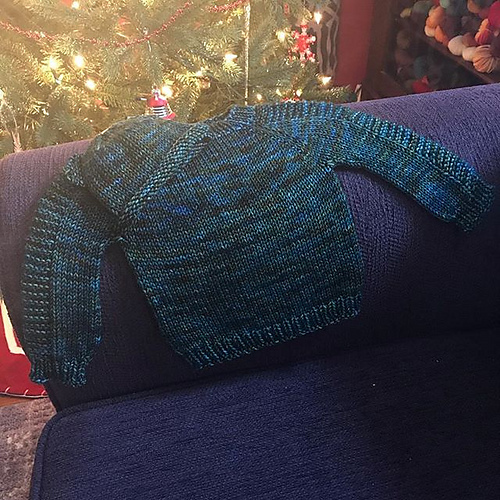 I had ordered some skeins from Blue Moon at the end of January and hadn’t seen them in the mail so I called them yesterday to find out what was up. The story is that their latest shipment of yarn had to be returned (400lbs of it – gawd, can you imagine?) so they are way behind in their orders. I wonder if this will effect the club shipments?